Within cities, air pollution can vary dramatically block by block and depending on the proximity to freeways and warehouses. Those were some of the findings in a new report published in the journal Environmental Science and Technology on Monday led by researchers at the Environmental Defense Fund and the University of Texas at Austin, using Google Street View cars equipped with air-pollution sensors from a startup called Aclima. 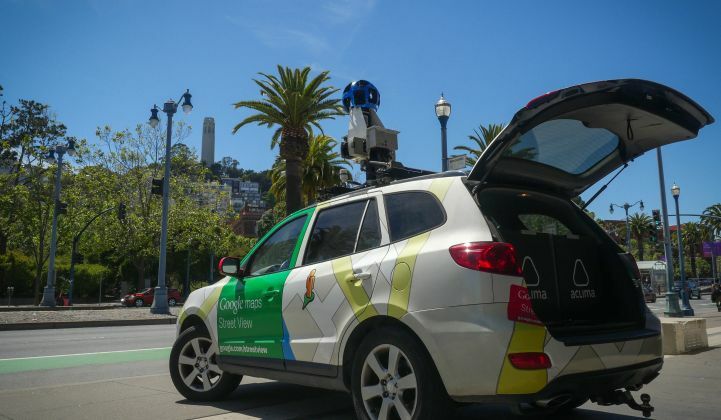 Over the course of a year (May 2015 to May 2016), two Google Street View cars were driven at standard speeds, for six to eight hours a day, around many of the streets in Oakland for an average of 31 days of the year. The sensors collected data on emissions of black carbon, nitrogen oxide and nitrogen dioxide emissions. These environmental pollutants come largely from vehicles and power plants. Black carbon emissions are particularly driven by diesel-powered trucks. Oakland has a variety of low-income neighborhoods situated in close proximity to power plants, refineries and the freeways that intersect the city. The report found various hot spots with higher emissions around Oakland, particularly in West Oakland, both close to freeways and near warehouses where trucks deliver and pick up goods. The Environmental Defense Fund points out one such area on its website where homes and schools were located close to an industrial warehouse. The findings are important because they can help urban planners and companies make decisions that can alleviate these dirty emissions in residential neighborhoods and near schools. For years, environmental groups have been concerned that the state of California hasn’t spent enough resources on addressing local air pollution needs. But even more than addressing specific issues in the city of Oakland, the study shows how this model of using vehicles equipped with these types of sensors over a period of time can bring new insights to pollution monitoring. The model can be scaled efficiently and economically, the report found. In future studies, the researchers recommend that vehicles could operate just 10 to 20 days (instead of the 31) over the course of a year and still gather enough data to discover important insights. The sensors were provided by Aclima, which is a San Francisco-based startup that has developed a sensor that it says can detect more granular data about air pollution at a lower cost than other sensors on the market. There are already stationary air pollution sensors around the Bay Area, but in contrast, these mobile units are meant to find these block-by-block air pollution details. Aclima also uses analytics and machine learning to clean up and make sense of large data sets. The Oakland project collected air emissions data from 24,000 kilometers (15,000 miles) driven on 750 kilometers (470 miles) of Oakland roads. On a call with the media on Monday morning, Aclima’s Chief Scientist, Melissa Lunden, said the company’s sensor system could eventually cost 100 to 1,000 times less than traditional lab sensor equipment. Aclima has been working with Google since 2011, when the startup began a project to detect Google’s indoor air quality.